GI Tract Supplement for Dogs | Elk Velvet Antler | Wapiti Labs, Inc. Soothe your dog’s upset stomach with this all-natural herbal supplement based on time-tested, traditional Eastern Medicine formulas. Our concentrated liquid formula harmonizes the stomach. Available as a concentrated liquid formula. Made without synthetic ingredients. We use a proprietary processing method. Made in the U.S.A.
GI Tract for dogs is the first supplement that I have tried that works for every dog in my house (up to 15 at a time). Since I foster dogs that come to me in various health states diarrhea and upset stomachs are commonplace I’ve tried many different remedies to alleviate any stomach problems. GI Tract is the only thing I’ve found to reduce upset stomachs in every dog consistently. I can’t say enough about how much I think this is as close to a miracle product as I’ve ever seen. My dog Zorro had terrible gas after switching to a new food. We didn’t want to switch him back to the old food, so my friend told me I should try the G.I. Tract formula – this helped Zorro immensely! He was able to stay on his new food, and the G.I. Tract formula seemed to soothe his stomach after the switch. I only wish we had used it before we switched! – Kathy M.
I have an 8-year-old yellow lab who suffers from motion sickness; she would get sick when we went on long car rides. My vet recommended the G.I. Tract product, and it has helped her during the rides to and from the cabin, which is her favorite place in the world. I’m sure she’s very grateful for such an effective product! – John F.
Sloshing stomach seems to be 90% resolved. Better than any vet suggestions! Is your dog having trouble following you on the hunt? 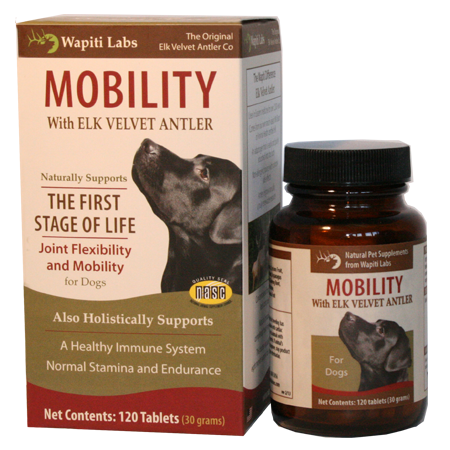 Try Wapiti Labs’ Mobility Pet Supplement for Dogs! If you’re searching for the perfect supplement to keep your dog healthy long into old age, try our Mobility Supplement for Dogs today!